Welcome to the next installment of Rescue Me in which we feature pets waiting for adoption at the Vancouver SPCA. Today we would like to introduce you to a lovely cat named Phoebe. She is a beautiful plus sized sweetie with a snowy white coat. Phoebe came to the Vancouver SPCA in early September as her caretakers were no longer able to give her the care and attention that she required. Phoebe had been living with them for the last three years. Previous to that she had been living happily with her original caretaker, but when her original caretaker became ill, Phoebe was re-homed with friends. Having had two homes in her short lifetime, the Vancouver SPCA is hoping that Phoebe will finally find her forever family. Phoebe would do best in a household where she is the only pet, as her diet needs to be carefully monitored. Due to her large size, Phoebe isn’t able to move quickly, therefore she will need to be kept indoors where it is safe. Phoebe has lived with both men and women, but she is extremely fond of women. When she hears a woman’s voice she waddles over to investigate. Phoebe loves lounging around, being social and being groomed. She is a quiet girl and has a barely audible meow. If you think you could give Phoebe her forever home, or know someone that can, please contact the BC SPCA Vancouver Branch by telephone at 604-879-7721 or by email at vancouver@spca.bc.ca.Phoebe is currently in foster care, but her friends at the Vancouver SPCA are happy to set up a meet and greet. As always, we thank you in advance for sharing this information to help Phoebe find her forever home. UPDATED October 16, 2014 – Phoebe has found her forever home. The East Van GoGos invite you to their 6th Annual Jazz Brunch Sunday October 19th. What is a GoGo you might ask? Gogo is a Zulu word meaning “grandmother”. The Greater Van Gogos which includes chapters in various parts of the Lower Mainland are grandmothers and ‘grandothers’ working in groups to support African grandmothers raising a generation of children orphaned by AIDS. This network of grandmother groups in south western BC are dedicated to raising funds and awareness for the Grandmothers to Grandmothers Campaign and the Stephen Lewis Foundation. The brunch on October 19th is a fundraiser for the East Van GoGos which will feature a musical performance by Brian Tate who will entertain you with some jazz, gospel and African music. Homemade brunch will be provided along with coffee, tea and juice. Suggested donation is $25. Limited seats for this event. To order your ticket contact Sharon, 604-254-4071 or eastvangogos@gmail.com. The brunch takes place from 12:00 – 2:00 pm in the Grandview Room at the Trout Lake Community Centre, 3360 Victoria Drive, the music gets under way at 12:45 pm. Come out and support these great GoGos! Vancouver Farmers Market is pleased to announce they will be opening a second Winter Market in East Vancouver. 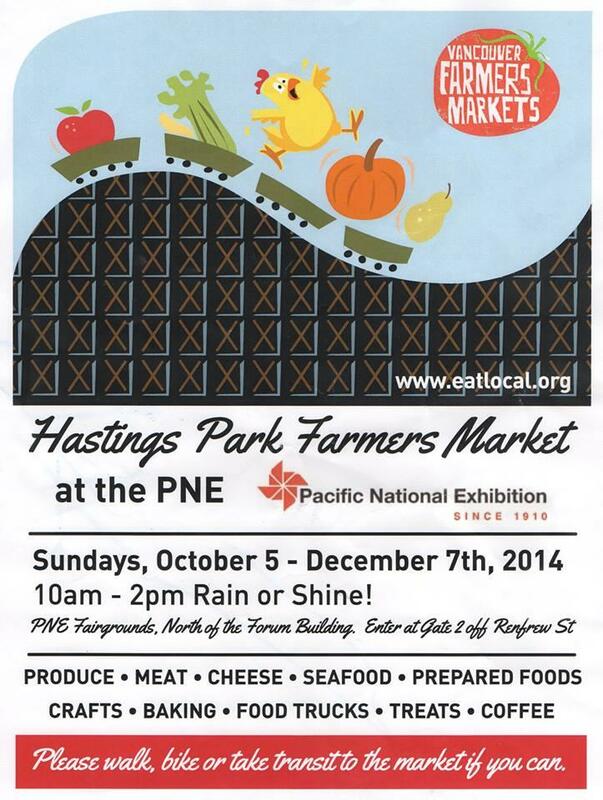 This 9 week trial market will be located at Hastings Park between the Forum and the Agrodome. You will be able to stroll down tree-lined pathways under twinkling lights and wander through the Italian Garden. A playground is close at hand for those coming with little ones. The market will feature many of your favourite vendors from the summer markets and will include a selection of local winter produce, fish, meat & dairy, artisan prepared foods, baking & treats, coffee, local crafts and of course some hot food trucks. The market starts Sunday, October 5th and will run every Sunday to November 30th between 10:00 am – 2:00 pm rain or shine. The Baker’s Market is back this Fall! The first of 6 dates get under way Saturday, October 4th. If you haven’t attended this market, it is a community based event that brings out baking enthusiasts, pastry students, mommy bakers as well as budding entrepreneurs. Each week you will find different bakers on hand offering a wide array of baked goods. 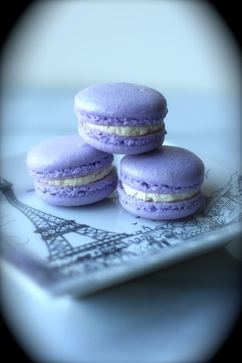 Some of the delicious things you will find include exquisite French macarons by J’adore les Macarons, delicious lemons squares from The Lemon Square and other delectable baked goodies. You will find different vendors each week, so the offerings will be a bit different each time, but the types of goodies you can expect to find include organic muffins, brownies, handmade chocolates, vegan, gluten free, Belgian waffles, lemon squares, cupcakes, scones, preserves, breads, tarts, granola and much more. If you have something specific you’d like, we do recommend you arrive early. Some items do sell out rather quick. The Baker’s Market will be held at Moberly Arts & Cultural Centre, 7646 Prince Albert Street (60th & Fraser). Admission to the market is free, there is ample parking and lots of samples! So come out and support your local talented creative bakers. If you this miss the kick off on October 4th, not to worry, there will be 5 more markets on October 11th, 18th, November 22nd, 29th and December 6th. The market runs from 11:00 a.m. to 3:00 p.m. each Saturday.